De Staat are here to disrupt your day and shake up any expectations you may have of exactly what to expect from a Dutch alternative rock act, if you had any expectations at all. Because, without being too vague or unspecific, the one thing that De Staat certainly are is genuinely alternative. The first contact I had with the band was the promo video for 'Make Way For The Passenger' - in this fast paced world where thoughts are restricted to 140 characters and the bus or my bathroom double up as an office, I can't remember the last time I sat down to watch a music video. But something about the spoken word, furious guitars and visual motorcycle stunts twinned with onscreen lyrics struck me as truly different, and something I was keen to investigate further. Formed in 2006, 'I_Con' is their third full length release and it seems as if it could be mined from the thought processes of a number of disparate artists chained together in a Hackney basement, forced to collaborate as if their survival depended on the outcome. 'Make Way For The Passenger' is an oddity amongst an album of oddities, glaringly obvious when listening to the opening salvo of 'All Is Dull' and 'Build That, Buy That'. From aggro-spoken word, I dip into The Black Keys-esque foot stomping opener and then onto sea shanty by way of Gogol Bordello's gypsy punk that descends into synthesised chiptune madness. In this vein, the album continues to throw imagined genres and far flung influences against the wall in an attempt to see what sticks. 'Devil's Blood' starts life as a Moby track before a rootsy sound underpins a laid back rock ballad spliced with shoe-gaze, before switching to rousing industrial noisecore for 'Witch Doctor'. Big beat, gregorian chanting, Bloc Party, folk songs, Queens Of The Stone Age, flutes, whistling, the list goes on... The sheer ambition or absolute madness of this musical magpie collection of sounds is admirable, even more so in how cohesive the album actually remains. If there were cameras capturing De Staat's every movement as 'I_Con' was put together, then I would be keen to see the footage that connects the dots between the M.I.A-riffing 'Refugee', 'Down Town''s art rock format and the touches of Beastie Boys glimpsed on 'Input Source Select'. More than seeing into their studios, I wonder what could be seen if we looked into their minds. 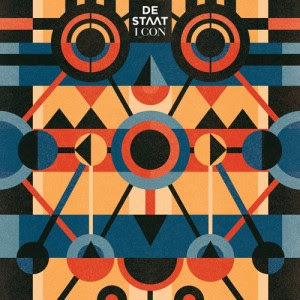 What De Staat have created is a multi=cultural tapestry of sounds, forms and textures, and a persona that cannot be judged simply on the basis of one song. When viewed as a whole, 'I_Con' is ever-evolving, ever-changing whilst still veering far away from being a challenging listen. What De Staat seem to have discovered is musical alchemy. 'I_Con' is out today. Find more info at destaat.net.